ARTSPREAD : News Detail : Artspread and Smile Foundation present an arresting online art exhibition, showcasing a well curated collection of the finest Indian Contemporary Art, to support the education of underprivileged children. 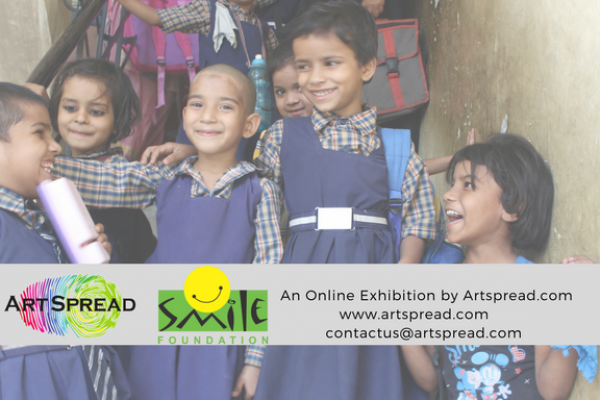 Artspread and Smile Foundation present an arresting online art exhibition, showcasing a well curated collection of the finest Indian Contemporary Art, to support the education of underprivileged children. Coming from diverse parts of the country, our artists present unique expressions of their environments, influences and inspiration. The result is a visual treat of colour, texture, form and themes. Art Spread is an online art gallery, dedicated to showcasing the very best in Indian Contemporary Art to the world, offering you Indian Artworks in various mediums, styles and formats including landscapes, portraits, abstracts, sculptures and photography, all at compelling prices. Its focus on quality is intense and it partners with only the most gifted, the most creative and the most technically sound Indian artists. Smile Foundation is an Indian NGO directly benefitting over 400,000 children and their families every year, through more than 200 intensive projects spread across 25 states of the country. Part proceeds from the collection presented by Artspread will go towards the cause of child education courtesy Smile Foundation. Join us in spreading smiles on many little faces by being a part of this initiative. Every contribution matters!